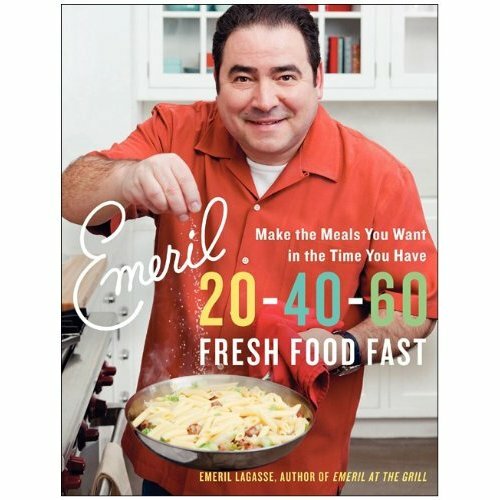 This little cookbook , Emeril 20-40-60, has turned out to be one of my favorites. It’s filled with really simple, flavorful recipes that anyone can make. I’ve made many delicious dishes from this book so it falls into the GREAT category on my cookbook shelf. Because the book is divided into 20 minute recipes, 40 and 60 minute recipes, you can really find something that suits the time you have to cook… and it focuses on using the freshest ingredients. In classic Emeril style there are a number of recipes that call for his “essence.” I made a container of it (he includes the recipe in the book) and store it in my spice cabinet. It’s good stuff to put on chicken, vegetables – really any recipe that you want to add a little kick. My only complaint is that my book is now falling apart.